ETLand is the leader in the 21st-century electronics/information distribution industry. 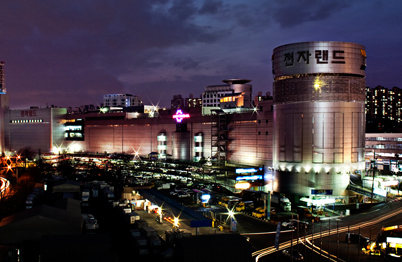 Since opening Korea's first shopping mall exclusive for electronic merchandises in 1988 after the implementation of the Yongsan Electron- ics Complex Urban Planning Project by Seoul Metropolitan City in 1985, ETLand (www.i-etland.co.kr) has been leading electronic appliance retail in Korea for the past 30 or so years. It is still growing to become the leading retail store of electronic appliances in Korea and Asia. Moreover, Yongsan ETLand is widely popular because of the diversity of its featured products, convenient location, low prices, and ease of shopping. It is also called the mecca of cutting-edge information and communications industry since customers can purchase not only the latest computers but also semiconductors and computer parts. Easy access from Yongsan KTX Station makes it easily reachable from anywhere in the nation; the large parking lot and many mass transit lines further add to the convenience. ETLand offers fast information and fun. Shopping is not the only thing that can be done at ETLand. You will find not only a wide selection of electronic appliances but also the latest information on state-of-the-art technologies. There are always various events and interesting programs going on to make sure the visitors have fun; Lotte Cinema, a large multiplex cinema, will provide great entertainment. Easy and convenient access as the pride of ETLand. Located at the center of Seoul, it can be easily accessed from not only Seoul but also anywhere in the country.The nearby KTX Yongsan Station, many mass transportation lines serving the area, and the large and convenient parking lot attract customers. ETLand offers everything customers want. ETLand, the place for all information and entertainment needs such as home appliances, computers, mobile phones, and game boxes! Customers love ETLand for its easy access as well as the low prices and dedicated A/S. It also has a furniture store corner so that newlyweds can satisfy all their shopping needs from home appliances to furniture in one place.